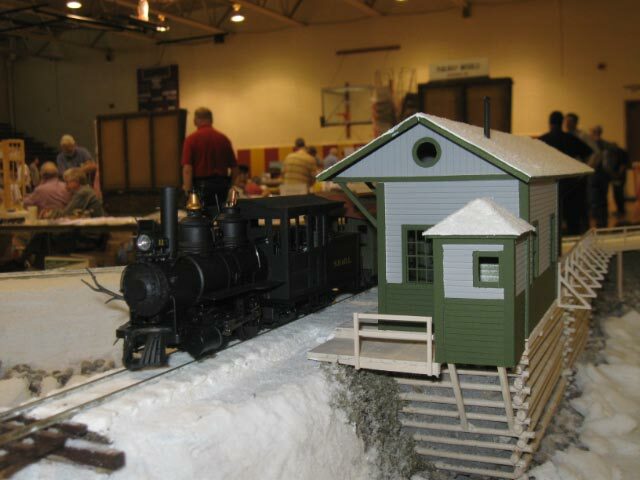 Midwest Narrow Gauge Show – An Energy Boost! 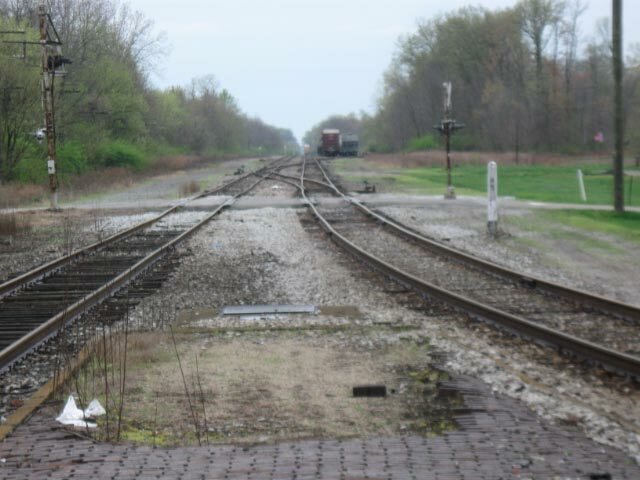 OK….so why does a modern standard gauge railroad appear on a blog about modeling a narrow gauge railroad of 1912?….Because it is all about ME! I’ll admit, 3-4 weeks ago I was dreading the Midwest NG Show…. The Sn2 crew was not appearing, I did not want to answer the questions “Where are your modules”? I did not expect to see anything new, fresh…Other than the Sn2 crew and the HOn30 Great Lakes, who is doing any inspirational work? What’s in it for me? A desire to spend my money on other model railroad events (S-scale, RPM, etc…), I’ve never been to an RPM event…. 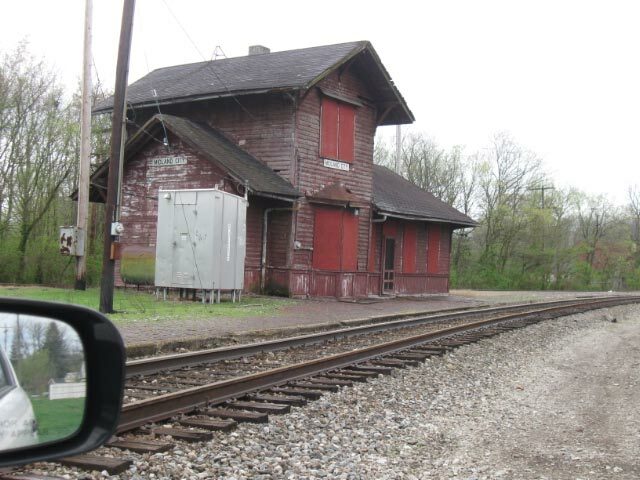 The first thing I did for me was to go trace the IORY (Indiana and Ohio Railway), a local shortline/regional railroad. I’m inspired to do this for the following reasons: 1) Sometimes I wish I modeled something closer to home, as railroad I could see on a weekly or monthly or even yearly. 2) I’ve been inspired by ISL (Industrial Shortlines) or Regional railroad modeling such as that of Lance Mindhiem, Joe Atkins, James McNab and Tom Johnson. Could the I&O be it for me? 3) My friend Paul Miklos models the B&O Ohio Division from Cincinnati to Chilocothe and the IORY where I was to hunt runs on that line. 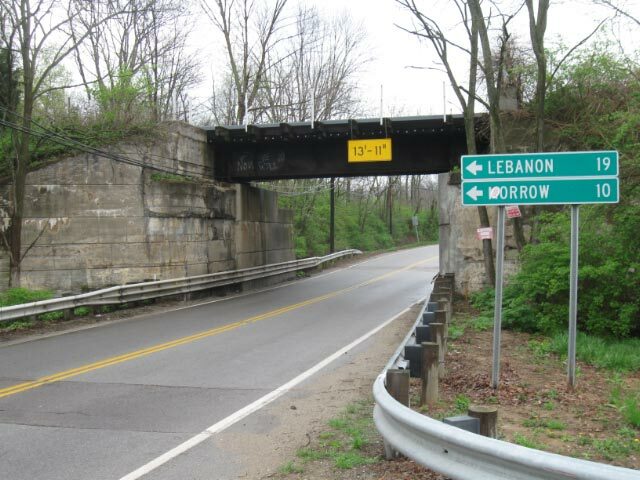 It's scenes like this bridge outside Blanchester, OH that would be enjoyable to model. This is highway 28, on the East end of Blanchester. I arrived on the IORY around 11am on Friday. Later than I’d hoped, but hey working the 3 hours in the morning was important to the Job…It does come first…. One of my goals was to find the industries of the I&O. 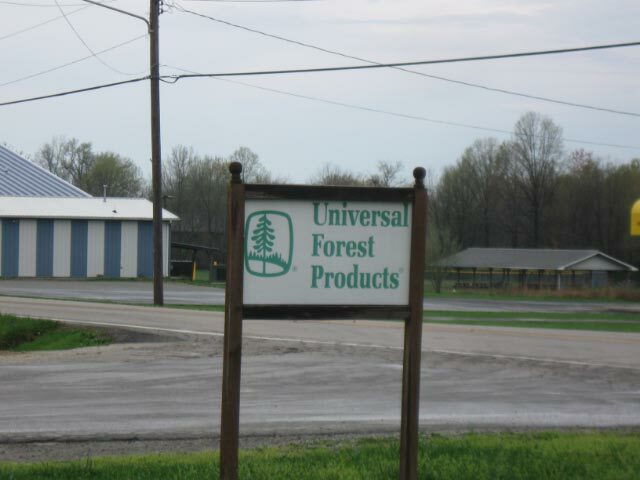 From google maps, Universal Forest Products looks to be a significant industry. 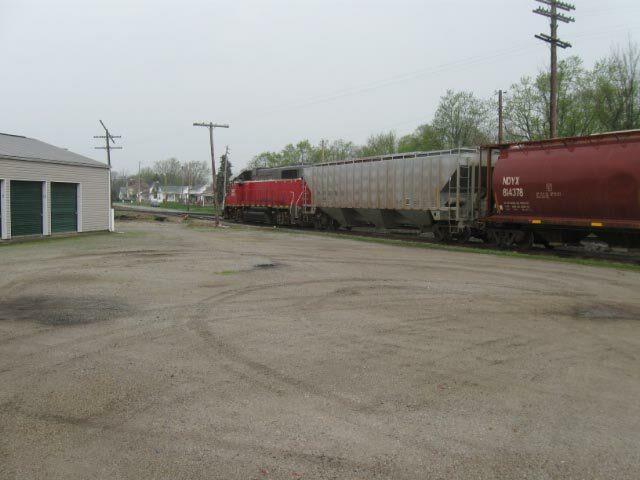 Sadly, it's not easy to see railcars from the street. I'm "shy" by nature or maybe I'm do not like to invade space or take risk. So this trip I did not attempt to go inside the fence. Maybe I can connect with someone who knows more about the industry. 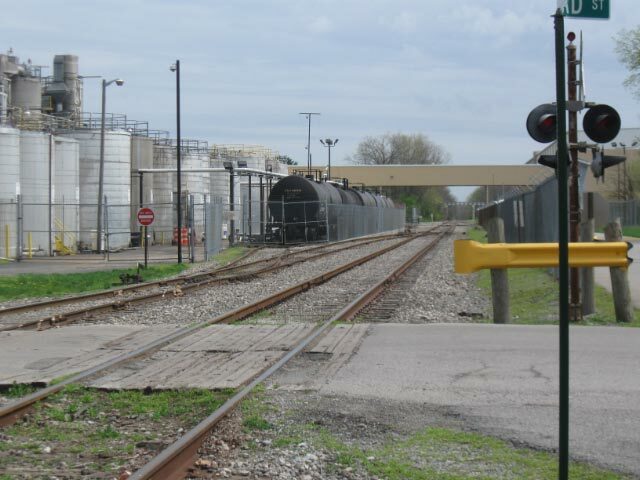 Midland City is where the B&O Ohio Division split from the Midland Division. The Ohio division went east to Chillocothe and the Midland division went northeast to Columbus. This photo is looking south toward Cincinnati. The visible track is the Midland Division. As best I understand it, the IORY Blanchester local works from Blanchester to Greenfield on the Ohio Division. May may also server the industries between Midland and Washington Court House on the Midland Division. A shot looking south from the Midland City platform. The two lines have joined. The small yard is used to hold cars. Some for Leesburg or Greenfield. 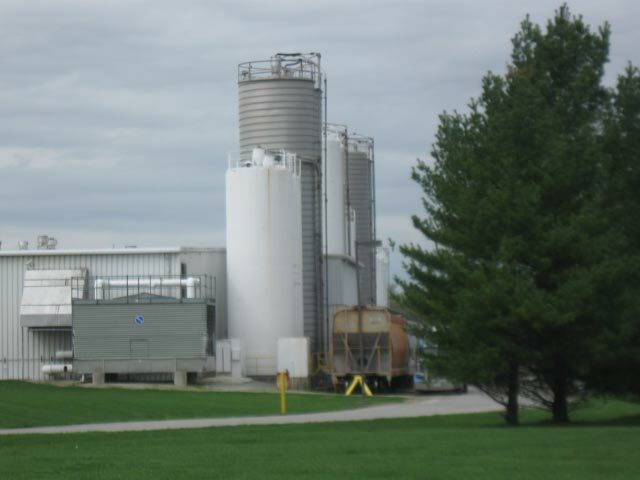 This a good sized industry out the east side of New Vienna. It had a few covered hoppers. The companies name is Huhtamaki, but I have no idea what they produce or how frequently the cars are switched. 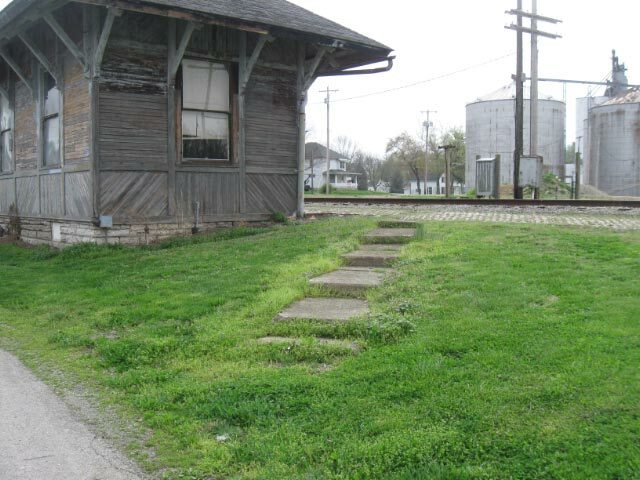 The Leesburg depot was once a lovely structure. Stone foundation, diagonal sheathing, simple overhang, hip roof (kind of B&SR like). It's March and the grass has already been mowed once. 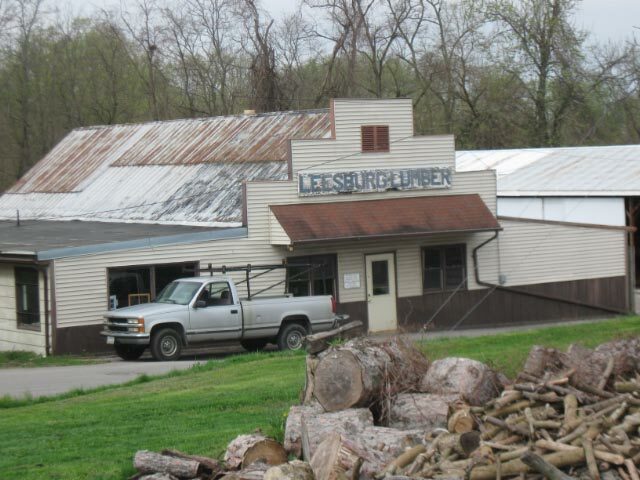 Leesburg Lumber is begging to be modeled. It probably looked the same in the 1950's when Paul is modeling. It's too far from the main line for what I envision doing (narrow shelf layout) if I were to model the IORY. The tank cars are spotted at "Candle Light". This industry is of interest to me. It is my understanding that the candle wax is brought in by tank car and then made into candles. Supposedly Chinese competition has Candle Light on the brink. Maybe high fuel costs will save this IORY customer. I'd like to understand if all spots are equal for the tank cars. If some are different grades of wax, then the the order of the cars would be important, making switching operations more challenging. I could not locate a spur to ship finished product. So I assume it goes by truck throughout the region (bummer). My tour of the IORY was taking longer than expected. So I skipped Greenfield (had been there 10 years ago) and headed for Cuba and the Midland up to Washington Court House. On the Midland, I saw a few locations. 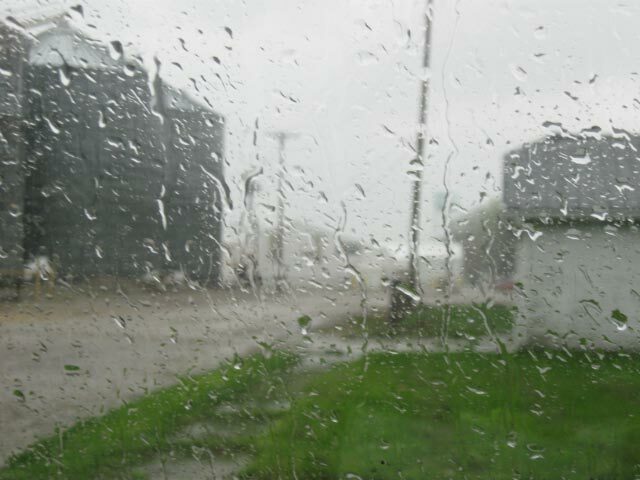 But my sites were hampered by the start of rain. My final stop of Silma was winner, as I caught CFE (Chicago, Fort Wayne and Eastern) number 3887 working the grain elevator. 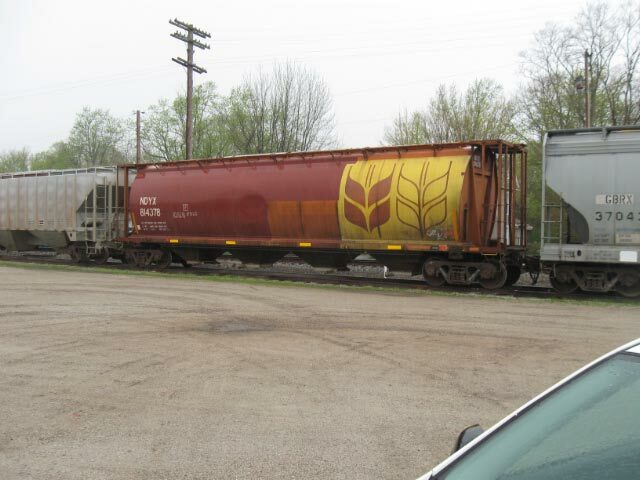 In the line to be switched was this Canadian cylindrical hopper, not something I expected to find on the IORY. What a treat..Three covered hoppers in this shot, and all of them are different (Ribbed, Cylindrical, Smooth Sided). These cars can be interesting. At 5pm on Friday, I was scheduled to meet my fellow Cincinnati meet attendees (Jim S, Roy, Don, Phil, Jim A) at an Italian Restaurant in Salem, OH. We’ve been going there for dinner for 10 years or so…Sort of a ritual Midwest Narrow Gauge Show ritual, since the time when the event hotel was the Timberlanes in Salem…However, It became clear that I was not going to make it there for the start of dinner. My work delay and adventures on the IORY had caused me to be 1 hour late. In the end I decided to skip dinner with the gang and eat a South West salad at McDonalds…A healthy choice, lower cost choice and not so rushed….I enjoyed dinner for me! After dinner, I arrived at the show, about 1.5 hours of the show on Friday night…I walked in the back door and it took me 1 hour to move 20 feet in the door….In that time I had nice conversations with Jeff Shumacker, Phil Gliebe, Gary White, Chris McChesney….Ah, good to be in my element, with people who speak my language (of trains) and my dialect (two-foot)….The conversations were “rich”, Maine 2-Foot, Sn2, operations, contemporary shortlines (someone in that group is planning to model the WC in 1990-2000 or so….). I was in mecca or “little mecca”, this is why I make the pilgrimage to Greenford, OH each spring. A look at the show indicated that railroads and displays were not “a plenty”. It look more like a swap meet with a few token displays to show this was a model railroad event….I quick look at the tables behind me showed some S-scale structures, Sn2 stuff and many other narrow gauge things. It was Crusader, they had more narrow gauge stuff on display then I could find anywhere else…. Then I encountered Mark Harris of Toronto…Mark was a SR&RL modeler, and one of the most prolific Sn2 modelers of all time. It is his rolling stock the is used most on my layout (mark moved on to On2, 5/8n2, and is now modeling a branch a of 1950’s CN in HO). I retired early (10:30) to the hotel room I shared with fellow Cincinnati modeler Don Phillips. I do not know Don well so it was an opportunity to learn more about his story. I will say that we both rooted against Kentucky (for Indiana) to no avail…I guess that is OK, as Keith Wisemenn is a die hard UK fan (Or is it?). The next morning I headed off to the meet…On my own..Again taking care of myself…My objective being to take in the meet before departing around 1-2pm. My goal was to see more IORY on the way home. My first encounter was with David Hoffman. He has acquire much of the old MDC HOn3 locomotives, trucks, shays, etc…He has a prototype of a Sn2/HOn3 forney mechanism using MDC 2-8-0 wheels (around 29-30″ drivers), not sure about the spacing. If anyone is interested, contact him. While there, I noticed that he had brass NWSL wheelsets for MDC HOn3 trucks. I’ve used a number of these trucks as stand ins for the Mark Harris built cars. Some of the trucks pick the points of switches due to being out of gauge. Reguaging them is not easy. So I acquired some of David brass replacement wheelsets. Next to David Hoffman's table was this On30 diorama of logging scene. On it was a nice Barnhart log loader. 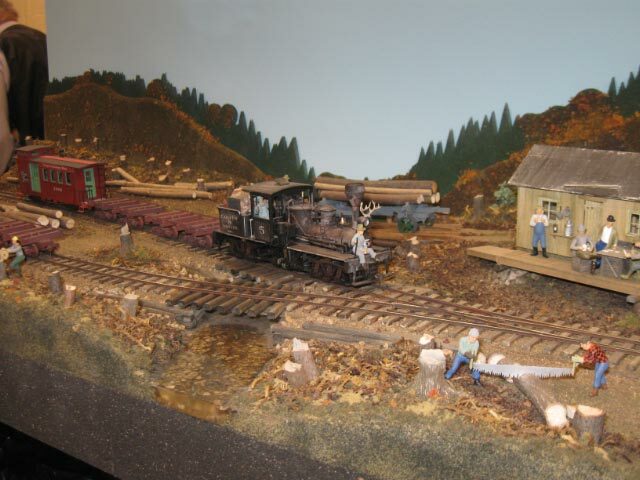 I'm not sure it is prototypical to have a Barnhart riding on top of narrow gauge cars, but otherwise the scene is prototypical (Sorry for the knit pick, I modeled and studied Pennsylvania logging for 20 years and never found one. Usually American loaders running directly on the ground loaded narrow gauge cars, at least that is what the Tionesta Valley Ry did). 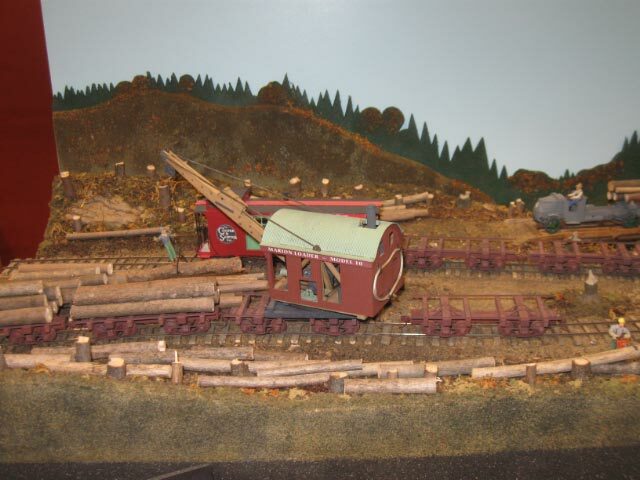 Here is another shot of the logging diorama showing the shay working the landing. I had now missed my targeted departure date and missed the SR&RL clinc. Luckily my good friend Jim Steward did not miss it, and brought me two of the handouts. They were of a 1912 Time-Table and a string diagram. Bummer would have been a good clinic, but I probably new most of the info. This info did feed me to think more about Phillips as a one town model railroad. Anyway, I took in more of the show and delayed my departure some more….I was not going to make the IORY on the way back…and I had to return to Cincy (5 hours away) in time for a party (hosted by family)….But before departing I took in more of the event and it’s people…more for me! 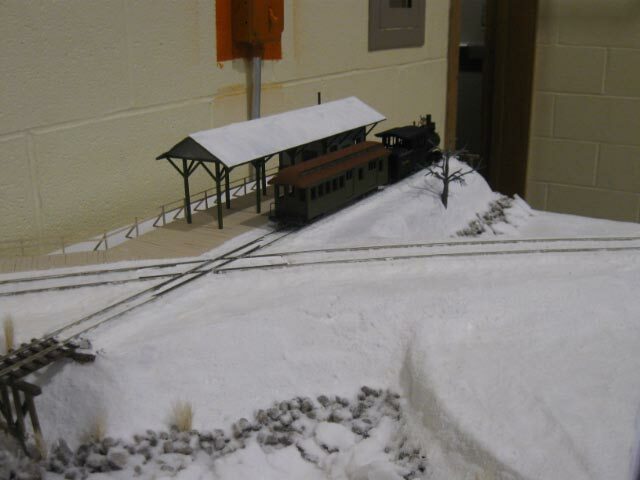 This WW&F Wiscassett depot scene in the snow was well done. I think it was On30, but I'm not sure. Overall view of the WW&F/MEC crossing in snow. The snow and ice (broken on the rocks) were nicely modeled. The ball signal (hard to see against the white wall backdrop) is inspirational. I'll be modeling several similar signals on the SR&RL. As mentioned before, the show was more of a meet. The number of displays was down from years before (so it seemed to me). For many of us, it is “new” stuff that gets our attention and many felt that there was not enough. Whenever I heard someone say that, I asked, “So what did you bring?”. In the model railroad press, RPM meets have been getting good press. They are growing. One reason I think they are growing is that many modelers bring models and contribute clinics. The modelers are making the event. The Midwest NG Show is no different, we get out of it, what we put into it. If you want “More Show”, then do more showing…. I’ve never been to a true RPM meet, unless you count the RPM room at the 2011 National NMRA convention. But from what I know, there are tables to display models (inprogress models, completed, etc..). The modelers spend time with the models enabling others to ask questions and build relationships. Maybe in the future, Gary can allocate a few open tables for sharing new modeling work. None the less, there were some new displays (see images above) and the content area (as usual I did not make it there). I’d like to applaud those who brought “new” stuff. I did not take photos of older stuff, but I do want to thank the HOn30 Great Lakes group as there setup is always work a trip around. Plus the people in it’s association are just folks (or something resembling that). My last encounter was with Dex Dexter. An HOn3 Colorado modeller armed with a 3 ring binder of photos, trackplans and notes…We met two years prior. I caught Dex taking inquisitive looks at my Sn2 Free-mo modules. Dex was a new on the Midwest NG scene, had dreams of a layout, and had the enthusiasm of an un-caged tiger. It was obvious that he was going to leap out and make something happen. Even then he had his binder of stuff (He’ll admit he is a bit annal). What Dex showed me in this years binder was wonderful and rewarding to me. As 2 years earlier, we had a 4+ late hour session at the Hampton. We had a discussion about trackplanning, prototype, etc. He had provided nice drawings and copies of the drawing and from that he broke down a few barriers and launched forward. I the insueing two years he also engaged with another modeller (closer to home) and made more great strides….Dex, thanks for sharing you “new” work, even if it was in book form….Another encounter for me! I challenge all of you to take something to your next show! It could be an in progress model, or photos of your layout, or trackplans of your dream, or photos of your basement…Build, Share, Learn, and Inspire I promise you’ll get more out of the show! Preparing to depart, I encountered Gary Kohler at the M2FQ table. He handed me my PLW order of Sn2 flat cars, Railway Crossing signs, and shingles…Ah…for me! I’ll present more on those when time permits. Around 3pm, I departed the show and headed for home…The drive went quickly (at times, 80 MPH) as listened to NCAA tournament basketball, including the start of my Ohio State Buckeye’s win over Syracuse, and reflected on the adventure. 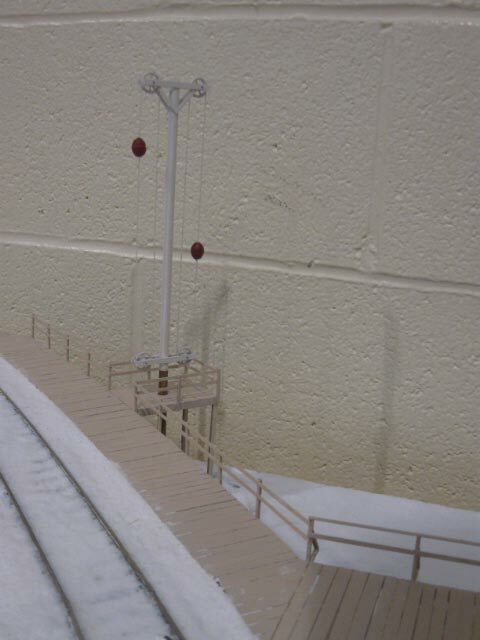 It had recharged my battery for model railroading and even Sn2 modeling because I had done what was important to me. Seeing my railroad friends again! Talking 2-Foot, Sn2, and SR&RL! In the end, this event gave me new ideas on my Dream Layout, and how to get it started…This came indirectly from my conversations with Gary White and Chris Borgmeyer and they did not even know it. As I pushed Philips on them and considered the 1912 string diagram, it became clear that I too could consider Phillips as the start of my dream concept….More to come in future posts! Now to break down the barriers in my way…. This entry was posted in Comentary, Events. Bookmark the permalink. 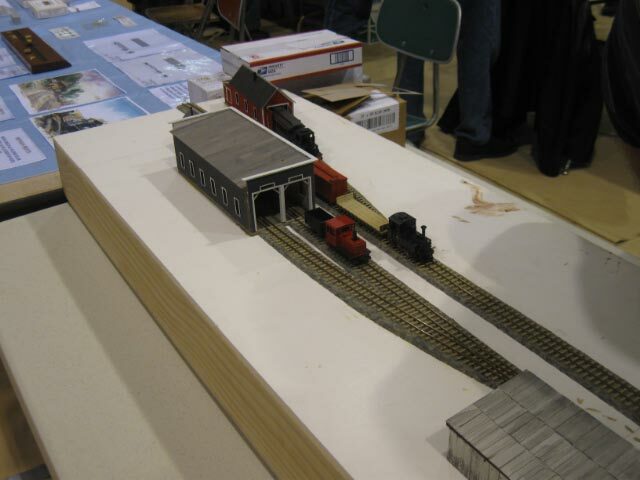 3 Responses to Midwest Narrow Gauge Show – An Energy Boost! Sounds like a great time. Thanks for reporting on it. You’ve also captured something that many modelers forget – that the hobby IS a hobby and as long as you’re enjoying it, you’re doing it right. Tracing the IORY is an example of that – it’s not (yet) what you model, but you had fun. So you did it right. Well done! I’ll second what Trevor said… Sounds like you had plenty of quality “me” time. I was considering going to this year’s show, but it sound’s like there wasn’t much to see (operating layouts). Why wasn’t the Sn2 crew (other than yourself) there with their modules? Thanks for the show report… Didn’t get any of this out of McChesney. He just told me it was a good time (which I’m sure it was).